“Most of the elements of this success are easy to trace. For one thing, Landseer lived at a time when the mercantile middle-class came into emergence as collectors. The great houses of the aristocracy were already full to bursting with accumulated works of art. Their days of patronage were over, since there was no more room for acquisition. Landseer’s works were ideally suited to the tradesmen who now came to the fore, with their large empty new houses that had to be filled. There were not graduates of the Grand Tour and so had little use for the Italian schools. Nor did they want elegant old master portraits of people to whom they were not related. They preferred their contemporaries. 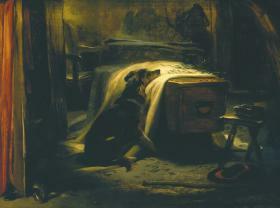 Furthermore, pictures like Landseer’s were easy to understand. They told stories, they bore moral messages, they contained pathos, homely sentiment, and character. They faithfully reproduced the textures and scenes which a society lately rural and now turned to manufactures could appreciate. The wildness of the Scottish landscape and the interpretation of Highland life in which Landseer specialized also made a great appeal to the Victorian sense of the romantic. And, finally, his pictures were respectable. Edward Fenton, “Portrait of a Victorian Painter, with Dogs,” The Metropolitan Museum of Art Bulletin, vol. 10, no. 5 (January 1952): 160.